Marymead CEO Camilla Rowland receiving the large cheque from Fiona O’Donnell. Picture: Supplied. 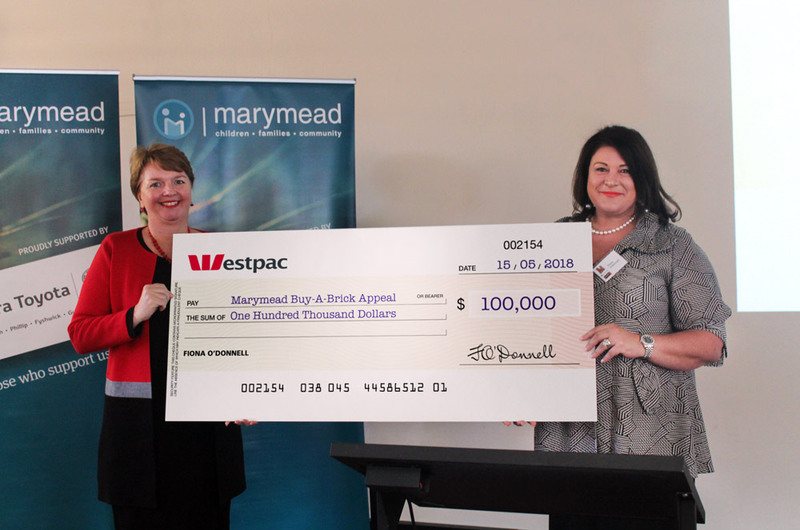 Marymead officially launches its Buy-A-Brick Appeal providing hope and change for children in need and in times of crisis from the ACT and regional NSW. MARYMEAD hopes to raise $1.3 million from their Buy-A-Brick Appeal which was officially launched at the Rheinberger Centre in Yarralumla. Funds raised from the appeal will help the organisation to build two of three care cottages at their original Narrabundah site which is being redeveloped. The cottages will provide much-needed short-term accommodation for vulnerable children, young people with disabilities, those who have recently left hospital, as well as families who have travelled from regional NSW to access services in the ACT. The launch of the appeal, which was the organisation’s biggest, was attended by Marymead patron Lady Helen Deane together with husband Sir William Deane, and was timed to coincide with the UN International Day of Families and the start of National Families Week. Marymead CEO Camilla Rowland said she was delighted more than $108,000 was raised at the launch. “What a great start to the appeal with naming rights to one of the three care cottages already sold,” she said. “We encourage individuals, families and organisations from the ACT and regional areas of NSW to show their support by buying a brick, or two or more. Marymead’s Media and Marketing Manager, Jeff Griffiths, said the wonderful start was mainly due to Fiona O’Donnell, a previous board member of the organisation, who handed over a cheque for $100,000. “This amazing donation grants the O’Donnell family naming rights of the first cottage which will be called ‘Coral’s Cottage’,” he said. Marymead continues to provide a vast range of high quality, innovative support services to children, young people and their families throughout the ACT and regional NSW, with offices in Canberra, Goulburn, Moruya, Wagga Wagga and Young. The organisation’s array of programs and services now includes an autism centre, child and family counselling, disability support, early intervention and family support programs, respite care, a grandparents’ support network, mental health family support, parent education groups, post-separation support, residential care and supervised contact and changeover. Marymead also delivers its permanency program in the southern and western NSW regional areas which includes foster care, restoration support, adoption and guardianship.